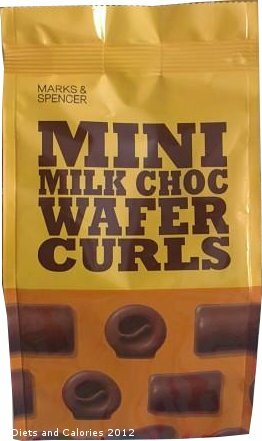 Here’s another pack of mini chocolate treats from Marks and Spencer. Mini Milk Choc Wafer Curls have layers of crispy wafer inside with a smooth milk chocolate outer coating. They’re usually placed right by the checkouts, which, when you’re stuck in a long queue, are impossible not to pick up. They’re just the right size to eat in one bite, hence their name. This is probably the best option if you don’t want to leave a mess of flaky wafer crumbs all over the desk or wherever you’re eating them. However, although each bite has only 25 calories, they're so moreish it would be easy enough to get through the lot on your own. If you're watching your weight, consider taking smaller bites to prolong the experience, or take three or four out of the pack and put the rest away. At 100g, it's a small pack. But nibbling through the whole lot will set you back 530 calories. This is definitely a pack of treats that's best shared around. Available in Marks & Spencer Food Departments (usually by the checkout area). Nutrition Information per wafer: 25 calories, 0.3g protein, 2.6g carbohydrate, 1.7g sugars, 1.4g fat, 1.1g saturates, trace fibre, trace salt. Suitable for vegetarians. High fat, high saturates, high sugar, medium salt.